In cooperation with the Miami Conservancy District, City of Dayton and Montgomery County (and as part of the ‘Rivers, Cycling & Active Lifestyle committee of the Greater Downtown Dayton Plan), Five Rivers MetroParks has just announced its proposal to remove the Monument Avenue low dam and install two grade-control whitewater/bypass “canoe” channels that will make the Great Miami River navigable through downtown and past Carillon Park. 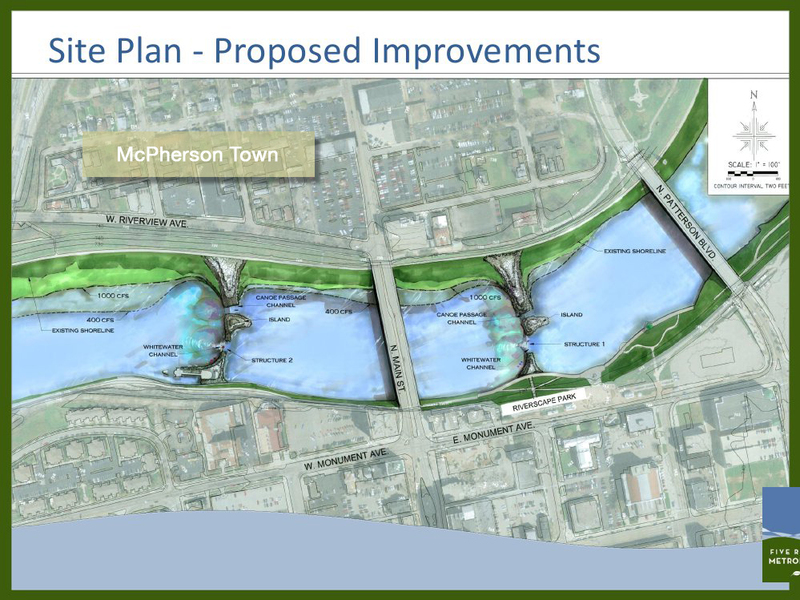 If plans are realized, a river access point and parking may be added to McPherson Town as soon as 2013. Before the project can proceed, agreements would be reached with the Miami Conservancy District and city of Dayton. Permits will have to be obtained from the U.S. Army Corps of Engineers and Ohio Environmental Protection Agency. Permitting will take at least a year.